Govani Dental is led by Dr. Shaheda Govani, DDS. Dr. Govani is a dentist devoted to oral health and dedicated to patient care and comfort. Her vision is to provide excellent dental care and comprehensive oral health education to patients throughout the Oshkosh community. Dr. Govani lives by the patients-first philosophy – providing the highest standards of care in a welcoming, safe atmosphere. 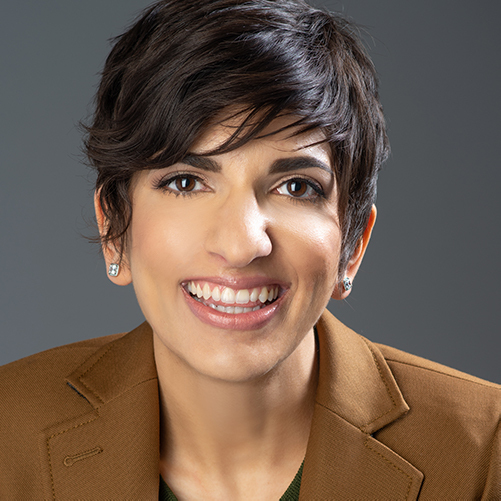 Born and raised in Oshkosh, Wisconsin, Dr. Govani returned to the community to establish her general dentistry practice. She’s thrilled to be serving friends and family members as well as new patients. In her free time, Dr. Govani enjoys staying active by going to the YMCA and weightlifting with her husband, Neil. She also enjoys reading, watching movies and trying new places for dinner. Dr. Govani and her husband have started to remodel their old character home and are looking forward to the challenges the projects will bring. Ready to Join the Govani Dental Family? If you’re interested in becoming a Govani Dental patient, schedule your appointment online or by calling 920-231-1955. I definitely recommend Dr. Govani. She is knowledgeable and takes time with her patients to make sure they fully understand everything. The dental hygienists are all positive and very thorough with cleanings! I had my recent visit with Dr. Govani and she always exceeds expectations, as I have been going to her since she has opened her practice. I am truly amazed every time I am there for a routine cleaning, and or if I have to have some minor work done. I would recommend anyone and everyone to Dr. Govani and her team. I trust her when it comes to my dental care, and what she would recommend. I was a patient of Dr. Tulip's before he retired & had high expectations for Dr. Govani because I loved Dr. Tulip. I have to say that everyone has exceeded my expectations! Everyone is so friendly, caring & professional! I love that Dr. Govani is so thorough, gentle & always explains what she's doing. I have a fear of the dentist, but they really help ease my mind with their caring nature & gentle touch! Kelly the receptionist (a title that doesn't seem adequate enough), is just a treat! I'd love to bottle up her cheeriness & give it to others! Keep up the great work! Everyone at Govani Dental is wonderful and professional. Kelly at the front desk is such a warm cheerful person, she always makes me smile. The staff and Dr. Govani are always very thorough and I appreciate the time they take with each appointment. I would trust my teeth to no one else! Dr. Govani and her staff are always eager to answer my questions and give honest explanations. They've got such positive attitudes and ensure everyone is comfortable the duration of the visit. You can tell they throughly enjoy working for Dr. Govani, I would highly recommend! We loving going to the dentist! Years ago you would have never heard that coming out of my mouth! The staff here are great and so caring towards their patients. They always explain what they are doing and ask if you have questions. Kelly does an amazing job with making sure you understand the billing portion as well! If you're looking for a great dentist you should go here! Compassionate, gentle, thorough and kind. My daughter used to be afraid to go to the dentist. That changed when we started going to Govani Dental a few years ago! My family won't go anywhere else! I have been a patient at Govani Dental for several years. The office has grown, but the same outstanding level of patient care is present. Dr. Govani, Dr. Childs, and their staff are committed to treating patients kindly and educating them on their dental care and procedures. The customer scheduling and billing staff are exceptional as well. Dr Govani is the most caring and compassionate dentist I’ve ever been to. The staff is great all the way around! I went after not being to the dentist in years and Dr Govani put me at ease right away and never made me feel bad about the state of my smile. I suggest anyone and everyone to see Dr Govani! I hate hate HATED the dentist my whole life, and actually avoided going if I could.. until I needed to. I had heard amazing thing about Dr Govani and her staff so I gave it a shot. How ironic is it that her office happened to be the same place with the same little log cabin that I went as a kid. (scary!!!) Let me tell you she put me right at ease. Starting with the receptionist Kelly, who has to be the nicest person in the world, to the hygienists and Dr Govani herself. She took her time, made sure I was comfortable and didn't rush. I would highly recommend Dr Govani to anyone looking for an amazing dental office! Our family has been seeing Dr. Govani since she opened her practice! She connects with our children, talks with them about their activities, school, health and well-being. She truly cares for them! I love that she discusses their exam and care with me on a very personal level. Her office hours are conducive and flexible to busy family schedules. I am blessed have known Dr. Govani since she started her practice. Being in the dental industry myself, I can be a real stickler and can honestly say Dr. Govani and her staff are the most kind, considerate, compassionate, understanding and thorough professionals I have ever met. The key to the perfect doctor patient relationship is communication and everyone at this office is above par on this skill. I can guarantee anyone visiting Govani Dental will love this place and their new bright smile. Thanks for all you do Govani Dental! Disclosure: Govani Dental is a client. That said, Dr. Govani is also my family's personal dentist. Both my daughter and I visit her regularly and have for several years. The team at Govani Dental is amazing! We always feel that nothing is missed and great care and professionalism is taken when checking on the health of our teeth. I feel blessed to have the team as our care provider and have the utmost faith in their recommendations. I had recently had a tooth break and needed dental work on it. I called and was able to be seen that day, what a relief . Dr. Govani provided exceptional care and service to me. I am unable to lay flat and she managed to work around all my medical issues to fix my tooth. I have never experienced such professional care. I would recommend her to anyone in need or just for routine care. She is the greatest.. So glad I am her patient. Peggy O'Brien Oshkosh Wi. My whole family goes here, including our 4-year-old. They are always timely and we've always been comfortable. My daughter has zero fear of the dentist thanks to Govan Dental! Dr. Govani and her team are so passionate and caring. They take time to share things that will impact my health not just today but years into the future. I appreciate that they always have my best interest at heart and feel blessed to be in their care! I would recommend them to anyone who wants the best care available!! This dental office works as complete team! The office staff is always kind,helpful,and cares about your needs as a dental patient. These could be emergencies , routine ,or just needing to change a appoinment for the third time they do it graciously.The dentist help each other making the visit run smoothly and giving you the best of two dentist should need be. The staff that work with Dr .Govani,and Dr Child's, are always well kept ,polite, skilled and well educated in the latest technology giving the patient the best cleanings and help during a dental procedure. I'm a person who has had enormous amounts of dental work in the past and continue needing it today in this clinic I came to three years ago and the work is top notch and I'm so satisfied I hope I never have to go elsewhere. Govani Dental is awesome. We have two children who love going to the dentist because everyone at Govani Dental takes such great care of us. Highly recommended!! When my dentist retired, I was afraid to go to someone new. I was pleasantly surprised when I went to Govani Dental! They are so nice, and very professional! The hygienists have a very gentle touch, are very thorough, and are always concerned for the patients comfort. I would recommend Govani Dental to anyone looking for a dentist! Dr. Govani works very hard to make sure her patients are treated like family. It is very important to her that everyone be treated with the utmost professionalism, respect and understanding. She strives to offer her patients exceptional, reliable and compassionate care. She is the real deal. She will remember your name and what you were doing 6 months ago. If you don't want to be treated like a number then give Govani Dental a call. I've found Dr. Govani and all her staff to be extremely impressive. Everyone there is friendly, professional, and highly-skilled.Dr. Govani and my hygenist motivated me to floss more regularly, and I'm proud to report that I've been flossing for 956 consecutive nights!I have never felt this good about my dental hygeine, nor as confident in a dentist. I moved to Milwaukee but stayed with Govani Dental because of the excellent quality of care that I consistently receive from everyone there. Highly recommended. I would highly recommend Govani Dental. I have received excellent care during my recent implant procedure. The staff are highly skilled in their areas of expertise. They are a very caring, professional team that excel in all areas of dentistry. Love everyone at Dr. Govani's office. They are extremely helpful and understanding with schedule changes, etc. Also, they care about their patients and making sure all of them are comfortable with the treatment plan. Keep up the great work! © 2019 Govani Dental, LLC.